First off I want to say thanks to both Netgalley for sending me the e-book and to Smith Publicity for sending me the actual hard copy of this book, which is gorgeous! This book was great. 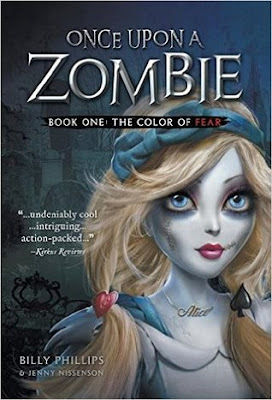 I absolutely loved this unique story-line of mixing zombies with our favorite princess characters we love so much. It's definitely not like any other zombie story, which is a relief. We are first introduced to Caitlyn, the main character in this story. The story starts off with Caitlyn in her room thinking of an excuse to not go to the dance at school. Now a few things to know about our main character, she has major anxiety issues. This has been happening to her ever since the disappearance of her mother. We are next introduced to Natalie, Caitlyn's younger, fierce and sarcastic sister who tells Caitlyn she thinks someone is watching them. At her new school, Caitlyn is picked on by the mean girls at school and ends up becoming friends with a nice boy named Jack. Jack tells Caitlyn that there has been rumors going on around the city that there are ghosts coming out of, deceased authors of fairy tale stories, grave. They make a plan to go to the cemetery the night of their school's Halloween dance to check things out. Some things happens due to the mean girls, where Jack and Caitlyn end up missing one another and Natalie ends up following her sister to the cemetery where they witness a ghost coming out of a grave. The ghost is looking for Caitlyn and ask for her help. Terrified of the fact that there is a ghost in front of her, Caitlyn doesn't know what to do, but Natalie jumps right in and following her younger sister, the girls end up in a fairy-tale world where all of the princesses are zombies! Traveling to a weird world, meeting other zombie princesses, the girls go through lots of crazy twist and turns that to me, brings them closer together as sisters. I won't share everything that happened, you'll have to find out yourself, but I will say that this was definitely a page turner. Although the beginning was a bit slow, I loved that this was a story that both myself and my ten year old could both read and both love. We've been talking about it for days and we are definitely looking forward to seeing what happens in the next installment. If you're a tween, teen, or a teen at heart, a zombie or princess lover, this is definitely a book you should be reading. Disclosure: All opinions are my own. I received Once Upon A Zombie at no cost for the purpose of this review. No other compensation was received.